Major League Soccer has been a landing point for a number of the world’s top players in recent years. While it still may struggle to shake the “retirement league” tag in some quarters, there’s no denying that MLS is becoming a lure for more and more high profile players. Not that we’ve seen too many of them in Vancouver. Far too often the league’s top names have decided not to travel here, avoiding the travel and the turf in particular. Certainly not all. The likes of David Villa and Andrea Pirlo came here. Even Robbie Keane, who hated the B.C. Place pitch with a passion, made the trip north. But others likes Thierry Henry, Didier Drogba, and Kaka stayed at home. As someone who wants to see the Whitecaps win, I have little issues with that in terms of the weaker teams that are in front of the ‘Caps the better their chances of achieving victory. But I also fully understand that if you’re trying to grow a league amongst various casual fanbases, players shunning markets is certainly not the way to do it. Saturday night was a rare occasion where one of the greats of the world game took to the B.C. Place pitch when Bastian Schweinsteiger and Chicago Fire came to town. While other players have decided to pick and choose what road trips they make, the German midfielder has embraced life in MLS since joining the Fire in March 2017. The veteran has travelled the length and breadth of the continent, playing on all matter of pitches, and doing the job he was brought into Chicago to do – play football and make a difference to the team. 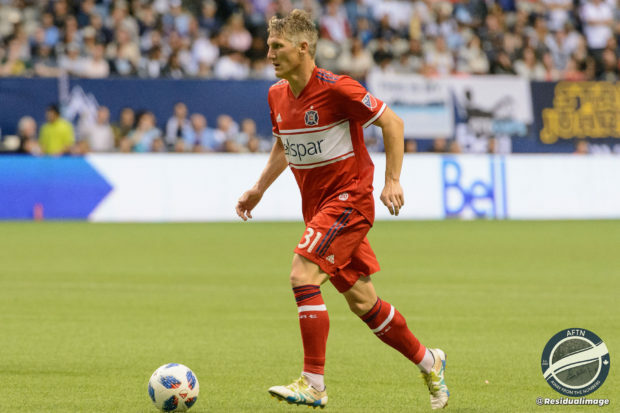 Schweinsteiger is in his second season with the Fire, re-signing with the team in January for another year after a debut MLS season that saw the German make 24 regular season appearances, scoring three goals and contributing six assists, as Chicago finished third in the Eastern Conference standings. But they were one and done in the playoffs, losing heavily at home to New York Red Bulls. This year the goal is to go deeper. Schweinsteiger has played in all but two of Chicago’s matches so far this year, scoring two goals and adding five assists, so has the MLS experience been all that the veteran had hoped it would be so far after his move from Manchester United last season? The league is certainly different to what the German has been used to during his long and storied career. 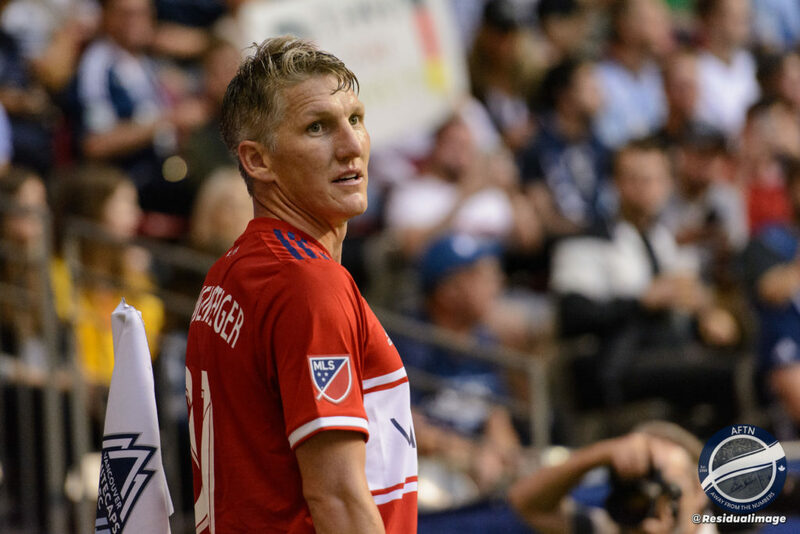 The travel can be tiring and take its toll, but one thing which Schweinsteiger has particularly been relishing is the competitive aspect of MLS. That competitiveness is once again very prevalent in the Eastern Conference. This season, inconsistency has cost Chicago dear. They’d been holding on to the sixth and final playoff place in the East before Saturday’s loss. That 3-2 defeat has now seen them drop below the red line with a 6-8-5 record. Like the Whitecaps, they’re already into the second half of their season. Every dropped point is now crucial, but having failed to register back to back wins all season, they need to find consistency and find it fast. “We are not happy with the end result,” Schweinsteiger said of the loss to the ‘Caps. “We gave away three goals, it’s too much, then it’s not easy to win the game. Some minutes we played well, we had possession, we played to the right player, and in some parts, we didn’t. We gave away the goals and we lost. It’s easy to forget that Schweinsteiger is still only 33-years-old. The World Cup winner has been around the game for so long now, but he still feels he has a lot left to give. Opposing him on Saturday night was a player nearly half his age, 17-year-old Alphonso Davies. Davies was away with Canada on Gold Cup duty when the two teams met in Chicago last year, so this was Schweinsteiger’s first chance to go up against him, and although he cautioned that he hasn’t seen him play too much, his first impressions of the Whitecaps winger were certainly positive ones. “It’s not easy for me to say because I haven’t seen so many games of him,” Schweinsteiger noted. “You can see he has speed, he has skills. Offensively, transition wise. He’s very good, but I think you should ask other players that know him better than me. And with all the European transfer talk continuing to ramp up on a weekly basis around Davies, does the veteran have any advice for Vancouver’s starlet on making it at the top level of the pro game?